Don’t forget to eat all your veggies and keep your elbows off the table! At 50’s Prime Time Cafe, you’re back in Mom’s kitchen being served by your cousin, uncle, or some other “family member!” Wherever you’re seated, you’re within eye shot of an old black-and-white set showing your mid-century favorites, and the dessert menu is presented on a viewfinder! You can’t get much more fun than this! Reasonably priced menu items include fantastic fried chicken, pot roast, chicken pot pie, meatloaf, and other favorites from your childhood. Great food, good prices, and fun atmosphere here. Your favorite old-fashioned treats — fried chicken, pot roast, milkshakes, and more! 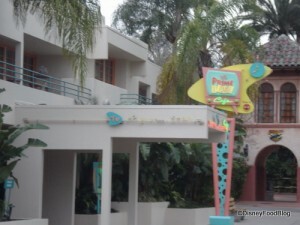 Disney Food Blog Review: Lunch at 50s Prime Time Cafe in Disney World’s Hollywood Studios! Don’t forget to grab a fun retro drink from Dad’s liquor cabinet or the Tune In Lounge next door.